In 2015, the civil rights movement rages on. If you’ve spent any time paying attention to the news media over the last week, you’ll know that this sentence has been impossible to escape. Headline grabbing as these words are though, they don’t quite explain the multifaceted reason why the city is receiving more press now than anytime since people discovered The Wire. On April 29, a 25-year-old black man named Freddie Gray was arrested by Baltimore police after running from them for unknown reasons. He tried to pull out a switchblade, and they arrested him. While in police custody, Gray asked for medical attention—a request they ignored. He later died from spinal injuries, the cause of which have yet to be determined. Shortly thereafter, protests and riots started. Coverage has included everything from the Gray family denouncing the violence, a mother scolding her son for rioting, and the mayor’s mishandling of the situation. In the last few days, things have begun to die down in Baltimore, though protests in other cities continue. What’s been additionally fascinating about the Baltimore coverage, however, is just how out of touch it’s made the mainstream media look. Uneducated people always run their mouths in situations like these, but there seems to be a special level of insensitivity coming from the many journalists who’ve been covering Baltimore. Even typically intelligent commentators have struggled with how to handle the conversation. The odd thing about this commentary is not that it involves the civil rights movement and Dr. King but that it frames their work as a thing of the past. The recent events in Baltimore, Ferguson, Mo., and New York have shown us that for too many cities across America, what’s past is present, and the problems therein remain just as potent as ever. The recent events in Baltimore, Ferguson, and New York have shown us that for too many cities across America, what’s past is present. Many have called for nonviolence in reaction to the Baltimore protests, using Dr. King’s name to back this approach up. Never mind that most of the protestors in Baltimore have been peaceful, what the media is forgetting about when they exploit Dr. King’s teachings for their own benefit is the atrocious double-standard applied to black rioters versus white rioters in this country. As actor Jesse Williams astutely pointed out on Twitter, riots are hardly a blacks-only exercise. 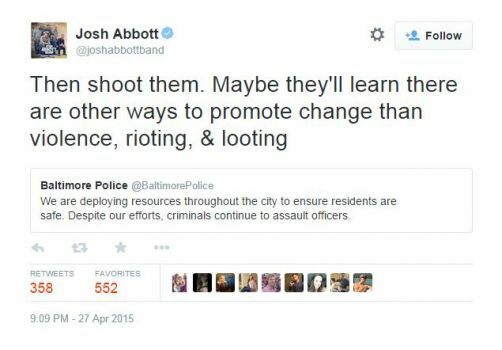 While the riots in Baltimore are indeed a reaction to systemic racial issues, the emerging and incredibly hypocritical thesis has become that when white people riot it’s OK, but when black people riot, it’s not. Or to put it another way, when white people riot over sports, it’s expected, but when black people riot over racism, it’s a disgrace. As Blitzer demonstrated with his short-sighted remarks earlier this week, any sense of context has been lost on the media when discussing Baltimore. Journalists bemoaning how “this doesn’t happen in America” have forgotten that the exact opposite is true; it happens all the time, it just doesn’t happen to them. Meanwhile, in the search for someone to blame, the burden is placed squarely on the shoulders of protesters and rioters, rather than on the institutions that helped kindle the fire which set Baltimore ablaze. A general lack of understanding has once again shown the great divide between people living with injustice and people reporting on it. Those in the media and everywhere else who are scorning the lack of peaceful protest in Baltimore are somehow forgetting that we just had this conversation with Ferguson. Once again, the city’s reaction is overshadowing what caused that reaction. Except with Baltimore, the oversight is even more egregious, because it proves we have yet to learn anything about how to discuss civil unrest. The riots should not be the crux of this discussion—what caused the riots should. In the search for someone to blame, the burden is placed squarely on the shoulders of protesters and rioters. So where does this discussion begin, if not with the protestors? The Baltimore Police Department is a good place to start, as they have routinely shown how they prefer to buy off black citizens who have been hurt by police brutality instead of routing out the problem from the inside. There are other reasons the Baltimore riots are a symptom and not a disease unto themselves. The socioeconomic factors in neighborhoods like Freddie Gray’s provide a powder keg for violence. After the great white flight Baltimore experienced decades ago, areas like Gray’s home of Sandtown-Winchester continue to be ignored by the city, except when the police enter them to maintain a cycle of brutality. The statistics reveal a different story than the one being covered by the mainstream media—of a community that’s been severely marginalized for too long. Baltimore proves we have yet to learn anything about how to discuss civil unrest. The unemployment rate in Freddie Gray’s neighborhood is one in five. Over half of all households earn lower than $25,000 per year. Almost a third of all families live in poverty. Close to a quarter of all neighborhood buildings are vacant, in comparison to 5 percent across the rest of the city. With 450 of its residents in prison, Sandtown has the highest numbers of incarcerated citizens in Maryland, costing the state and its taxpayers millions of dollars. A lawsuit filed by the Gray family against their landlord suggests that Gray and his two sisters all had “damaging lead levels in their blood.” As of 2012, 7.4 percent of children six and under living in the area had elevated blood-lead levels. And the the mortality rate for 25-to-44-year-olds in the neighborhood is 44 percent higher than in Baltimore as a whole, which already happens to have the fifth highest murder rate in the nation. Does this sound like an area well-equipped to deal with social injustice? What nobody wants to acknowledge is that the lives of black citizens in Baltimore have not been significantly improved since Dr. King fought to improve them years ago. Consider that in 1968, similar riots sprung up in reaction to his assassination. So when white people point to Dr. King and the civil rights movement and ask, “Why aren’t protesters using nonviolence? Didn’t they learn anything from the ‘60s?”, what they should be asking is: Why hasn’t anything changed over these past few decades? If Dr. King’s work is done, then why are police still killing unarmed black men? Why are so many black neighborhoods as impoverished as they ever were? Why is there a reason to riot anyway? It’s not like white people in the ‘60s treated civil rights protesters with a lot of respect then. But have white institutions done anything to earn the respect of protesters since? But regardless of how you feel about specific leaders in this new movement, it’s clear that the ideas MLK died for are as relevant as ever. We should be talking about his legacy, but we shouldn’t pretend that legacy has no correlation to the events of today. Instead, we should be talking about how that legacy informs them. Baltimore is still burning. Ferguson is still burning. But if we want to extinguish the flames in lieu of fanning them, we have to stop chastising rioters for not engaging in nonviolent protests and start remembering that the very foundations that white Americans built this country on were far more violent than anything going on in the streets of Baltimore today. Rioting can be a horrible thing, but it is not nearly as horrible as the ingrained oppression that’s wired into the soul of Baltimore and the soul of cities like it around the country. The civil rights movement never ended. We may occasionally forget why we need it, but the tragic deaths of Americans like Freddie Gray, Michael Brown, and Eric Garner serve as painful reminders that it’s as necessary now as it was in the ‘60s. Chris Osterndorf is a freelance journalist whose work has appeared on websites such as Mic, Salon, xoJane, the Week, and more. When he’s not writing, Chris enjoys making movies with friends. He currently lives in Los Angeles.